We are all familiar with names like Harvard, Princeton, Columbia, Dartmouth, Brown and Cornell - some of the schools that form the prestigious Ivy League. These are some of the most hallowed institutions in academia. Many don't know that many of the Ivy League universities were founded as Protestant divinity schools where future Protestant ministers were trained. One of them is Yale University in New Haven, CT, founded because Harvard had become too liberal. Interestingly enough, the Ivy League schools are among the most liberal institutions in the United States. Yale's motto is Lux et Veritas - light and truth. It's a theme derived from the writings of St. John the Evangelist. St. John equates light with truth and good. He equates darkness with evil and falsehood. This morning, gathered with the universal Church, we celebrate with great joy, our newest guardian of the truth, the light - Benedict XVI. His selection signifies a vindication of orthodoxy and fidelity to the Church's teachings; a continuation of the spirit of John Paul II's papacy and a clear voice that will penetrate the fog of moral relativism and secular tyranny so prevalent in our world. And yet, we know that he has already been vilified by many Catholics and some of the secular press. He has been called rigid, doctrinaire, hard-line and conservative. 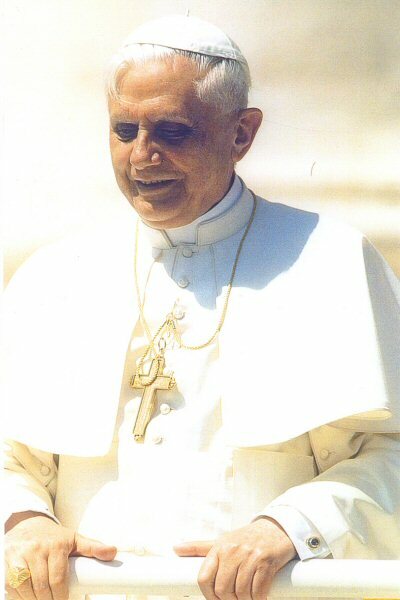 All of these critiques have been directed to the Pope by virtue of the fact that he served as John Paul's right-hand man and was the genius behind many of the courageous proclamations of the truth made during the last pontificate. Some have even referred to him as God's rotweiler. We prefer to call him our German Shepherd. Given all of this criticism, we ask, "Why so much acrimony at a time when we should be celebrating our unity?" and "Why so much angst when we should be grateful for this gift to the Church?" One religious sister on television this week claimed that she now knew that Jesus must be very sad because of the election of Benedict XVI. That poses a very interesting theological problem, doesn't it. Since we believe that the Holy Spirit selected the Pope, this sister's comment suggests that the Holy Spirit had saddened our Lord. Maybe she things that the Trinity has disagreements up in heaven and that they're soon bound to break-up. Maybe one day we'll begins our prayers, "In the name of the Father..." (with no mention of the other two). The problems that dissenters have are simple: they cannot accept absolute truth, except for one - that there are no absolutes (quite paradoxical). This violates the principle of non-contradiction. Dissenters refuse to be shepherded - to be lead by Christ's teaching as they are enunciated through the Church. Instead, they lash out against God-given authority, with no regard for virtues that our Lord extols when describing how we should act - like docile and humble sheep. Dissenters prefer the darkness of dissent and rebellion, not the freedom and glory of living in the light of truth as only the Church can provide. In the end, dissenters may simply lack conversion - they want to re-cast the Church in their own image, instead of rejoicing in living according to God's law. By contrast, the new Pope, like his predecessor stands for absolute truth, for the Gospel, for unity and communion. He is a man of simplicity of life, humility and dialogue. The cleaning woman at his office simply described him by saying, "Lui e vero Cristiano." - He is truly a Christian." Our Lord's exhortation in the Gospel, "Let your hearts not be troubled," should resonate with us for our Lord has given us a new shepherd - a true disciple. Our new guardian of the truth wants us to know that when Jesus says that, "I am the way, the truth, and the life," that it means that we no longer seek the truth as some abstract idea. Instead, we seek the truth who is now a person. Our new Pope, a man of deep prayer, has met the Truth in the person of Christ and he intends to lead each of us to where Jesus is, so that where He is, we also may be. Moreover, our 2nd reading from St. Peter's first letter tells us everything that we need to know in regards to how we should compose ourselves in these days. St. Peter writes, Beloved: Come to him a living stone, rejected by men but chosen and precious in the sight of God, and, like living stones, let yourselves be built into a spiritual house to be a holy priesthood to offer spiritual sacrifices acceptable to God through Jesus Christ. These words given 2,000 years ago are as relevant now as they were then. Indeed, Benedict XVI, the stone rejected by the builders (the secular media and the pundits) has become our cornerstone and happily so - the Vicar of Christ. I would like to close with a story regarding Pope Benedict XV - the last time we had a Benedict, right before the beginning of World War I, in 1914. Before becoming Pope, Benedict XV, was known as Giacomo della Chiesa, the archbishop of Genoa - a man of dynamic pastoral initiative and zeal. At the same time, one of the most powerful cardinals serving in Rome was Cardinal Merry del Val, a very holy man, whose spiritual writings are quickly becoming classic. Del Val was in charge of submitting names to the Pope, then Pius X, of men in the hierarchy who should be elevated to the rank of cardinal. Year after year, he would somehow skip over Giacomo della Chiesa, even if many cardinals thought that he was worthy to be elevated to their rank of service and honor. Some of the cardinals petitioned Pope Pius X to consider Giacomo della Chiesa. And so, months before he died, Pope Pius X did an override on del Val's list. He wrote-in della Chiesa in his own hand. Some time later, Pius X died and the new cardinal, Giacomo della Chiesa, became Benedict XV. And so, it is a custom in Rome for each of the cardinals to come up to the Pope, seated in his throne at St. Peter's to pay their respect, fidelity, communion and allegiance to him. And so, one-by-one these cardinals came up to the Pope. When it was Cardinal Merry del Val's turn, it was a scene of intrigue. After all, it was del Val who had prevented the new Pope from being named as cardinal some months before. When del Val knelt in front of Benedict XV, the new Pope said, "The stone rejected by the builders has become the cornerstone." And without missing a beat, Cardinal del Val replied, "And it is wonderful for us to behold." If you want evidence of the Holy Spirit working in the Church, you need only have watched television during this past month. The Holy Spirit is alive and well in the Church and has has not saddened our Lord. And as Peggy Noonan wrote recently in the Wall Street Journal, if you want to see the first miracle attributed to John Paul II, you already have it in the election of Benedict XVI. Let us confidently join our new chief shepherd, our guardian of light and truth and make St. Peter's words our own and truly believe that we are a chosen race, a holy nation, a people of his own, so that you may announce the praises of him who called you out of darkness into his marvelous light.